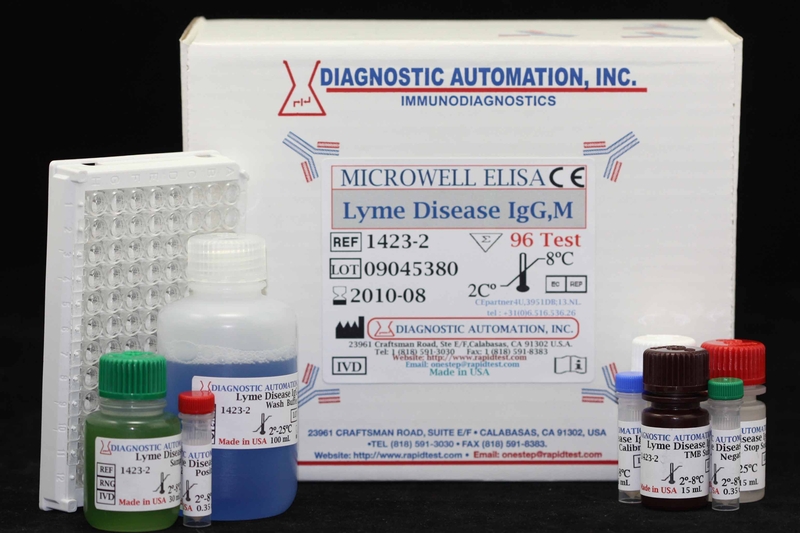 H-Pylori Antigen ELISA kit | CE-GMP | 818-591 3030-USA. 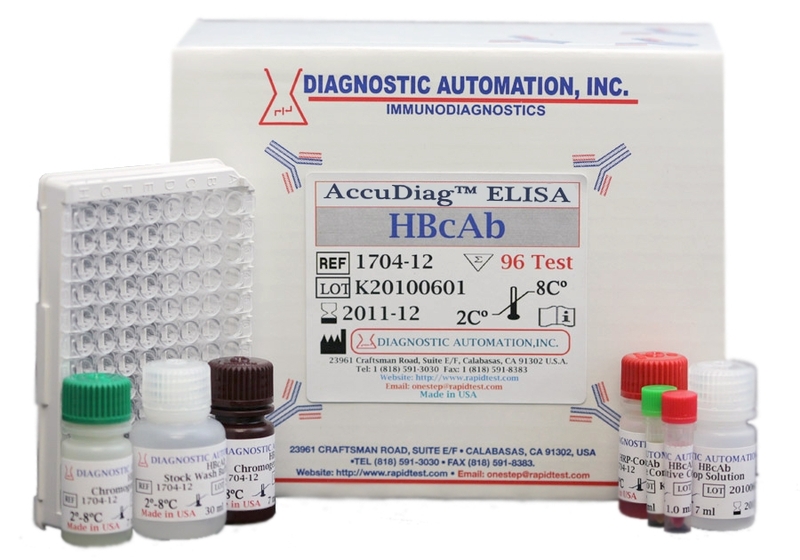 Diagnostic Automation Helicobacter pylori Antigen ELISA Test is a quantitative assay for the detection of H. pylori antigens in human stool specimens. The test results are intended to aid in the diagnosis of H. pylori infection, to monitor the effectiveness of therapeutic treatment, and to confirm the eradication of H. pylori in peptic ulcer patients. 1. Invasive techniques include biopsy followed by culture or histologic examination of biopsy specimen or direct detection of urease activity. Purified H. pylori antibody is coated on the surface of microwells. An aliquot of diluted stool sample is added to wells, and the H. pylori antigens, if present, bind to the antibody. All unbound materials are washed away. After adding enzyme conjugate, it binds to the antibody-antigen complex. Excess enzyme conjugate is washed off and TMB Chromogenic substrate is added. The enzyme conjugate catalytic reaction is stopped at a specific time. The intensity of the color generated is proportional to the amount of antigen in the sample. The results are read by a microwell reader compared in a parallel manner with calibrator and controls. All above positive samples were tested negative for Helicobacter pylori Antigen test. At least half the world's populations are infected by H. pylori, making it the most widespread infection in the world. Actual infection rates vary from nation to nation. The developing world has much higher infection rates than the West, including Australasia, North America, and Europe where rates are estimated to be around 25%. 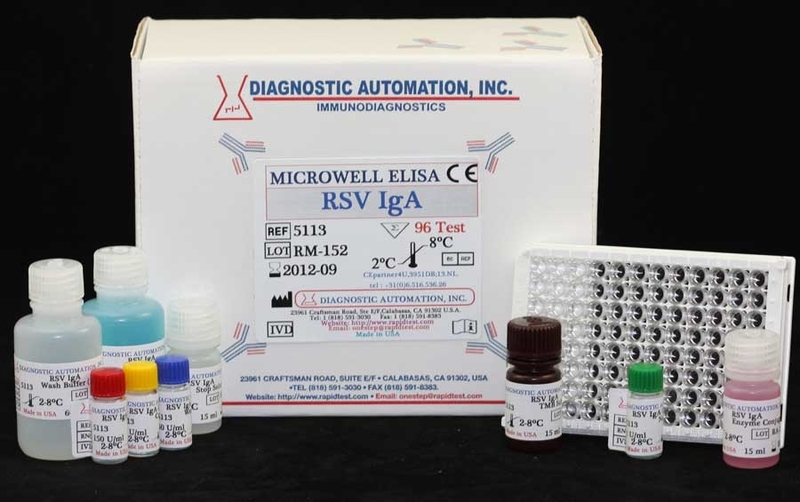 Our H. Pylori Antigen ELISA KIT with high sensitivity and specificity is a great tool for detecting H. pylori infection. 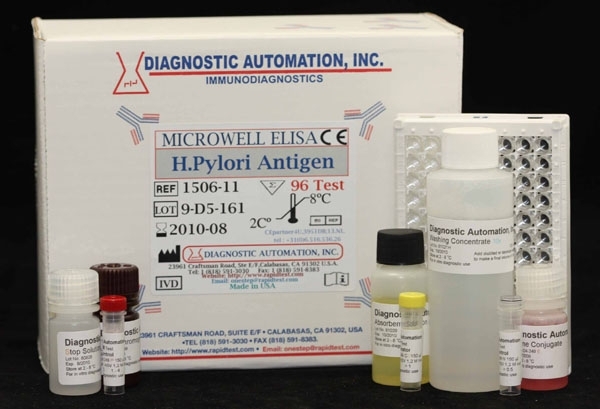 Diagnostic Automation Helicobacter pylori Antigen ELISA is a quantitative assay for the detection of H. pylori antigens in human stool specimen. The test results are intended to aid in the diagnosis of H. pylori infection, to monitor the effectiveness of therapeutic treatment and to confirm the eradication of H. pylori in peptic ulcer patients. Helicobacter pylori is a spiral bacterium cultured from human gastric mucosa by Marshall in 19821. Studies have indicated that the presence of H. pylori is associated with a variety of gastrointestinal diseases including gastritis, duodenal and gastric ulcer, non-ulcer dyspepsia, gastric adenocarcinoma and lymphoma. The organism is present in 95-98% of patients with duodenal ulcer and 60-90% of patients with gastric ulcers. The studies have also demonstrated that removal of the organism by antimicrobial therapy is correlated with the resolution of symptoms and cure of diseases2. 1) Invasive techniques include biopsy followed by culture or histological examination of biopsy specimen or direct detection of urease activity. The cost and discomfort to the patients are very high and biopsy samples are subject to errors related to sampling and interference of contaminated bacteria. 2) Non-invasive techniques include urea breath tests (UBT)3 and serological methods4. The UBT requires a high density and active bacteria and should not be performed until 4 weeks after therapy to allow resisdual bacteria to increase to the detection level. The main limitation of serology test is the inability to distinguish current and past infections. 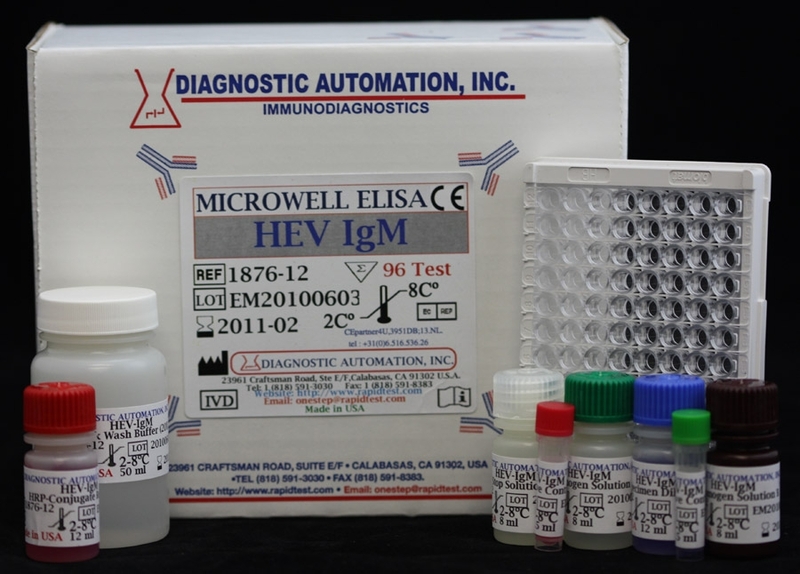 Our H. Pylori Antigen ELISA KIT have high sensitivity and specificity.